Just a super quick update outside of my normal scheduling to let you know that I’m engaged! My boyfriend of 5 years asked me to marry him on Christmas Eve and I couldn’t be happier! A lot of you who follow me on twitter will probably already know I’m engaged, but I wanted to do a more formal post about it because I’ve seen a few others do this kind of post and I love reading them. We’re planning quite a long engagement, as I want to wait until the end of uni so we are thinking around 3/4 years from now. But we will probably start planning in a few months as even that isn’t massively far away! The one thing I did just wanna mention is the backlash I got for my engagement. 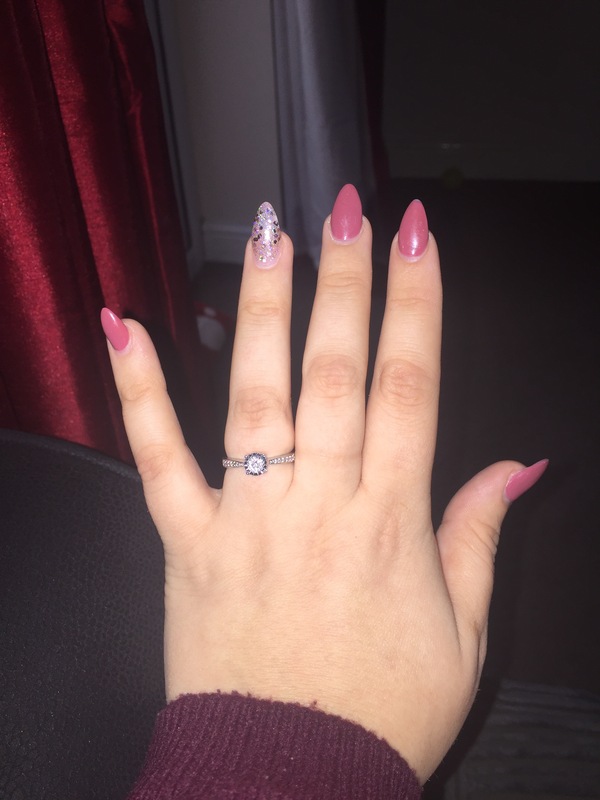 This is a happy post and I don’t want to make it anything else, but to be honest I am absolutely disgusted that I shared the news of my engagement on my twitter to be indirectly tweeted about by many many many different bloggers saying how ‘tacky’ it is because it was on Christmas Eve. I literally spent the night of Christmas Day crying because of what I was reading. I should have been happy and some certain bloggers ruined this experience for me. No matter what your opinion is, keep it to yourself. It’s unfair to upset someone anyway, never mind to try and ruin something that they have waited a long time for, are excited about and want to celebrate! I really am just so disgusted with the behaviour I saw and I will never forgive some bloggers for that. But other than that small negative, I’m super happy and I just wanted to share it with you all! Normal scheduling resumes today at 5. Hope you all had a lovely Christmas and an amazing 2017! I left you a comment on this earlier but idk if it went through so here I am again! 💞 I’m so so happy for you and your fiance – congratulations on getting engaged! I’m sorry to hear that a few judgemental people on social media got you down though, their opinions really don’t matter! You deserve all the happiness in the world and I can’t wait to hear about your wedding plans! Wow congratulations!! That ring is so beautiful he did well!! Bet you’re so excited! Congratulations to you both – what a fab start to the year! Congratulations honey! Wishes for you both the best of life together! Congratulations beautiful! Your ring is gorgeous. Sorry to hear about the negative comments you received. Try not to take notice of it all, I know it can be hard but just celebrate your engagement and stay happy.